BMW 635CSi. Adelaide Hills. Springtime. Goodtime. I made a half hearted effort earlier in the year, but to be honest it’s spent most of the Australian winter mothballed under it’s car cover. While I’ve been out having fun in the Land Cruiser. I recently had to move it away for a weekend, and realised I had totally forgot how much I like driving it. Time to take it out for some exercise! After a wet and wild winter it seems we are now firmly into spring here in South Australia, the hills are looking fantastic, and contain some driving roads par excellence. I live on the coast so this means a half hour slog across the north of the city, travelling due east. The sun battling the early morning cloud. Eventually you break free of the suburbs, the main arterial road becomes a twisting sinew of bumpy and broken tarmac that winds and weaves it’s way skywards. Having been driving the Cruiser and various other front wheel drive modern machines, the 6er requires some re-calibration. Control weights so heavy, most people think something is broken when they first drive it. Nothing about it allows you to be lazy, if you want to press on. I actually had a few goes round a deserted industrial estate on the way here, to familiarise myself with its on limit behaviour, I ease myself in, not pushing too hard early on, just enjoying the tactility of actually having to DRIVE. These roads are 2nd and 3rd gear territory, in-line on the, oh so 80's, dog leg gear gearshift. The pedal spacing is good for heel and toe. It doesn’t change direction like a modern performance car, you sort of ‘pour’ it into the bend. Once settled through, it has prodigious front end grip. Now, through literally the seat of your pants, you can feel exactly how much power you can feed to the rear wheels, the chassis squirming and communicating as you walk the line of grip and slip. Oh, you thought the 6 series was some sort of Boulevard cruiser? Not this one. Originally a UK car, it comes with the full fat Euro spec M30, high compression, no emisions restrictions, no catalytic convertor, not even a 02 sensor (freaked me out when I first had it, I thought someone had removed it, I had never seen a EFi car without one). It is urgent in a way few cars are, let alone GT’s. 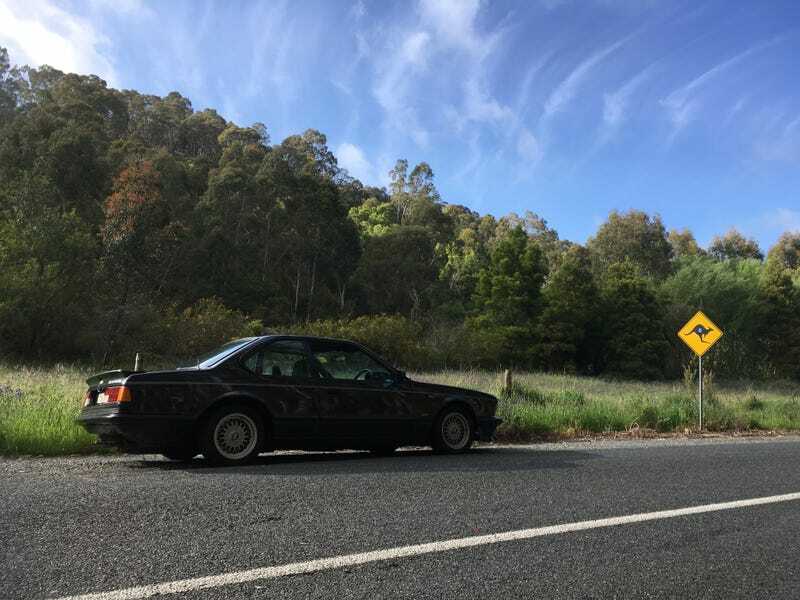 When I was originally looking to buy one I drove an automatic Australian spec, 635CSi, quite a different kettle of fish. Coupled with the uprated bushes for most of the suspension and importantly the rear subframe, a solid base makes a far more responsive chassis. Eibach/Bilstein suspension and a host of other detail changes, turns this into a proper driving machine. Against modern machinery it is not particuarly fast outright. Of course though that is not the point. It’s not really what the performance is, it is how it goes about it, is it enginging at 5/10ths? Absolutely. Is it a challenge to drive above 7/10ths? Absolutely. Disillusioned with modern performance cars? Get yourself a classic. Any local rev heads reading this will recognise my route. Grand Junction Road, through Houghton, Chain of Ponds, Tippet Road round the back of the resevoir, Cudlee Creek, Fox Creek and turn round and repeat. If you want to drive fast in the hills, early morning is the best in my opinion, while the traffic is sparse and cool air provides a punchier power delivery. As I head out into the steeper parts of the hills. Not all the roads have survived the storms we had this winter. Anyway, that’s pretty much the turn around point for this BLAT. The sun is starting to poke through the trees and the roads are getting busier. Time to cruise back, take a few photographs on the way. A quick stop at the Cudlee Creek Cafe, a well known haunt for drivers and riders, there is normally something worth looking at here. I quite liked the current Cayman, certainly over the current 911. Right up until I saw one parked up with an actual 911, now it just looks ugly and bloated. I retraced my earlier route, back past the resevoir. Then back through the villages and the spring blooms. Then tumble back down the hill to the city fringe. Better head for home. All 4 Adventure is on the TV!